This kit will bring anyone joy for years to come. 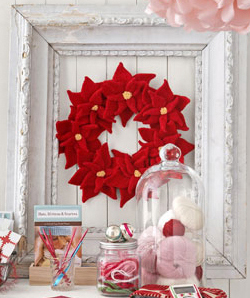 You can choose to make this poinsettia wreath for someone who doesn’t knit, or give the kit to someone who loves to create an heirloom piece of art. 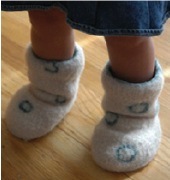 And, who wouldn’t love to spend wintery days wrapping their tired tootsies in these cozy, comfy, snugs. 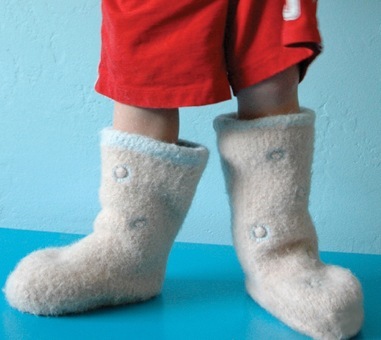 These kits include suede sole pads for traction, exterior wool, and interior lining of alpaca. Plus, they keep their shape. Hint to anyone listening, I would love to have a pair of these for Christmas. 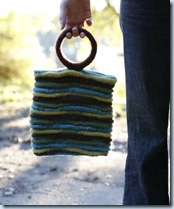 Or, for purse lovers, this tote has great texture with ridges formed using short rows and tucks. 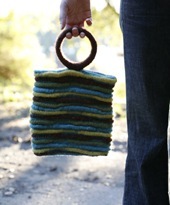 The handles are rings encased in i-cord and felted. Another great gift idea! We also carry a great assortment of other kits by Pick Up Sticks including the Sushi Wallet, Coin Purse, Blooms Bracelet, and another one of my favourites, Flora Doll. This entry was posted on Monday, November 23rd, 2009 at 8:34 pm	and is filed under Uncategorized. You can follow any responses to this entry through the RSS 2.0 feed. Both comments and pings are currently closed.